Red flowers consist of a warm color that can be used to influence one's perception of a landscape. For instance, using red flowers in a border can draw attention to that particular area of your yard and away from another. Take matters into your own hands and plant blooms of this color to help direct the gaze of visitors. The listicle of red flowers to follow assists with plant selection and includes examples of foliage and seed pods that bear this vibrant color. 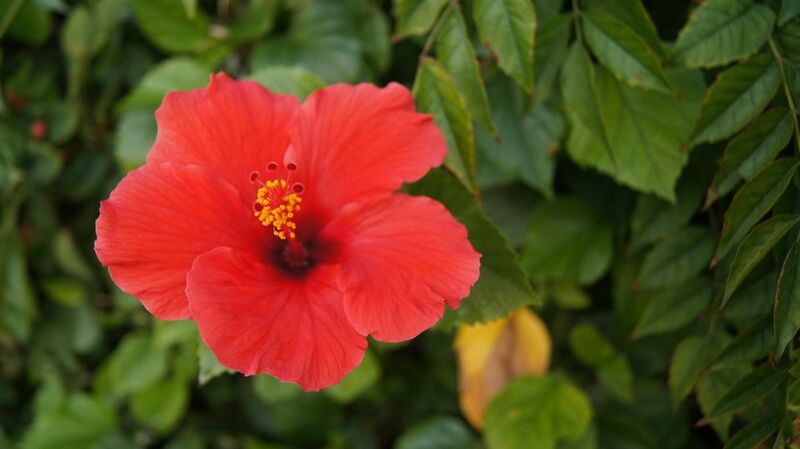 Large-flowered hibiscus plants are not necessarily tender tropicals. This "dinner-plate" style hibiscus flower belongs to a plant listed as being hardy to zone 4 but can be grown in zone 5 as well. Also known as "Hardy Jewel", Ruby Frost coreopsis is a herbaceous perennial and member of the aster family that can be grown in​ USDA zones 5-9. This perennial forms mounds to a height of about sixteen to eighteen inches, with a spread of up to twice that. Choose a location in full sun for it, give it a soil that drains well, and you should have few problems. It's excellent for attracting butterflies, plus the birds and the bees, while deer reputedly tend not to eat it. Since established plants tolerate drought, Ruby Frost coreopsis does furnish you with another option for xeriscaping, although planters should not expect prolific flowering if neglecting this perennial's water needs, minimal as they may be. Beyond their inherent beauty, bi-colored flowers are valued because they work very well in massed plantings. Massed plantings are when you plant an area with just one kind of plant or just a few kinds, but in great masses, in order to achieve the maximal effect with minimal design effort. A staple of fall planting beds, mums (chrysanthemums) come in a variety of colors. 'Autumn Red', shown in the picture above, is one of the brightest red mums available. Chrysanthemums are edible and have been used in traditional chinese medicine, helping with common colds, respiratory problems and reducing inflammation. Mums should be planted in spring so they may survive winter. As illustrated by the picture, lobelia flowers have little in common with the annual lobelia by the same name sold at nurseries. Perennial lobelias such as Lobelia cardinalis 'Fan Scarlet' are very similar to the type of wildflower known as "cardinal flower." This is a plant that weathers cool temperatures and grows three to five inches tall. The color of 'Red Charm' peonies may leave you breathless when you first glance at a picture of one. Peonies, in general, produce awesome blooms, but you don't necessarily expect the color burgundy in a flower. The 'Red Charm' peony can become so deep a red, a nice change of pace from the most common types, whose flowers are pink or white in color. As long as peonies are planted properly, they are low maintenance flowers that grow in fertile and moist soil that drains well. Geranium flowers are so dirt common, one must ask why they remain popular. The answer is surprisingly simple: geraniums hold up relatively well for an annual with large flowers and require minimal care. This durability is an enviable quality for a plant to have in cemetery plantings, a common use for geraniums, where plants are "on their own" for extended periods of time. Geraniums are also popular in the home landscape in window boxes and as bedding plants. There is a rich history behind the Maltese cross symbol. Legend has it that the Maltese Cross flower shares a bit of that history. The Knights of Malta are thought to have brought Maltese Cross flowers to Europe in their journeys home after crusading in the Holy Land. Also known as the Jerusalem Cross Flower, the Maltese Cross flower is drought tolerant and easily brights up flower gardens, attracting butterflies in summer and growing two to three feet tall. Short-lived but beautiful poppy flowers come in a number of colors. The red poppy flower featured in the picture above is one of the Oriental poppies. Poppies should be planted in early spring for summer and planted in early summer for fall. Poppies tend to grow best in lightly, ​moistened soil in a spot with plenty of sunlight. Red tulips may be planted with your snowdrops, whose blooms precede those of the red tulips in spring. Like snowdrops, tulips are spring bulb plants. Spring-blooming bulbs have a chilling requirement (which is why the warmer the climate, the tougher it is to grow them) and the ensuing cold weather is critical to their development. Be sure to furnish tulips with a soil that has good drainage. This red azalea is the 'Stewartstonian' azalea (Rhododendron x Gable 'Stewartstonian'), an evergreen suitable for growing in zones 5-8. Dimensions are approximately 5' x 5'. This red azalea grows best in part shade and in well-drained, acidic soil like most azaleas and rhododendrons. Apply an organic mulch to protect its shallow roots from water loss and extremes in soil temperature. Developed by Joseph Gable of Stewartstown, Pennsylvania, people often get the spelling of its name wrong, where it can be listed both as "Stewartstonian" (the correct spelling) and "Stewartsonian" azalea. The green summer foliage of this red azalea yields to a mahogany color in winter, making it an ideal candidate to provide year-round interest on the landscape. The azalea is a good choice for foundation plantings since it remains a relatively compact plant. The red coleus' color works well with yellow flowers such as marigolds. Coleus, although it does bloom, is grown as a foliage plant, not for its flower. Traditionally a shade plant, there are now types of coleus that can be grown in the sun. This member of the mint family should be considered for more than its color combinations, taking in mind delayed flowering, branching and special growth habits. Because of its color, the red salvia is useful in decorations for holidays such as Halloween and 4th of July (U.S.). Red salvia should be grown in full sun and is treated as an annual in most regions where it is used. Typically, salvia plants grow rapidly and can handle summer temperatures. Depending on the type of sage, plantings can derive from seeds, seedlings or cuttings. Castor bean seed pods are pretty to look at, but the seeds are very toxic. Consequently, this plant is not recommended for people who have kids playing in their yards. The poisonous substance known as ricin comes from the "beans" of this stately plant. You may have heard speculation that ricin could be used in terrorist attacks. The plant is commercially farmed, India being one of its biggest producers. Ricinus communis (its botanical name) has many uses. Learn more about castor bean plants. Some of the red amaranths can grow quite tall. For instance, "love lies bleeding" (Amaranthus caudalus) can reach three to five inches. Amaranth likes full sun and is grown as an annual. It is both a leaf vegetable and a seed (thought of as a grain) with multiple uses from nutrition to online seed retail. The Virginia creeper vines (Parthenocissus quinquefolia) here shows the clear beauty of their leaves. These plants do blossom, but your main interest in Virginia creeper vines is most likely to be as foliage plants. A second nice attribute is their berries. The leaves of Virginia creeper vines are green during the summertime but change their color in fall. Their fall color is very attractive and would be the prime benefit to having the vines in one's landscaping. Sometimes, the fall color is red while other times it's more of a burgundy. Virginia creeper vines are native to eastern North America. However, for those of you who live in the region, don't be lulled into a false sense of security by the term "native." These are very aggressive plants, and you would need to stay ahead of them (curtailing their spread), lest they take over large sections of your landscaping. They almost certainly would not be suitable for small yards.